I have some anxiety that this costume will end up looking like nothing more than a model railroad track on legs. This has me so worried that I might just leave out the perimeter railroad tracks. The first structure I was interested in was the Jungle Cruise, but I wasn't sure how I was going to pull that off. Fake water is going to look fake, but I hated to admit this at the beginning of the project. Surrounding the water would have to be a dense block of tiny jungle. I could buy one hundred little trees from the model railroad store, but I was still in the planning stage, so I held off for now. I'd figure out how to make a tiny jungle. The very first thing I actually began to craft was a simple building. My floorplan specified six separate buildings on a stylized "Main Street USA". 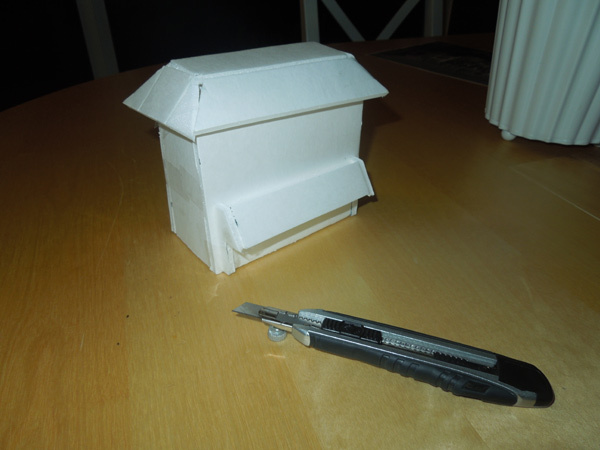 I cut walls and a roof out of foam board, to see what kind of scale I would be working with. This is what I came up with. It's tempting to add a bunch of details, but having a consistent level of detail is really important for a project like this one. This was just a practice house. After this first trial, Space Mountain seemed like a good place to start. It's a fully enclosed roller coaster, tucked into a faceted white cone-shaped building. This was a perfect job for white foam board. Making a short cone out of segments required some trials... and errors. 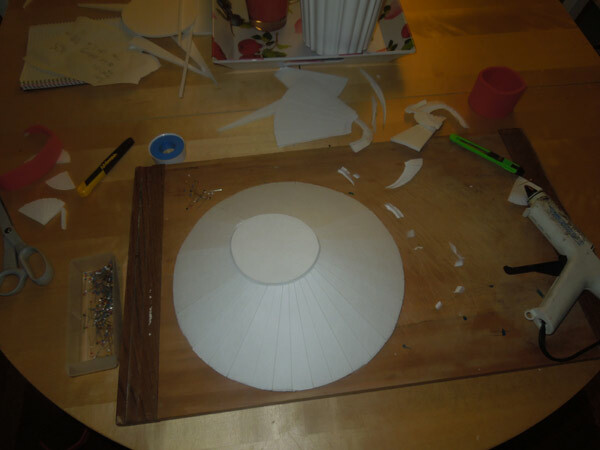 Luckily I knew what the base diameter needed to be, and I also had a good idea of the appropriate height. 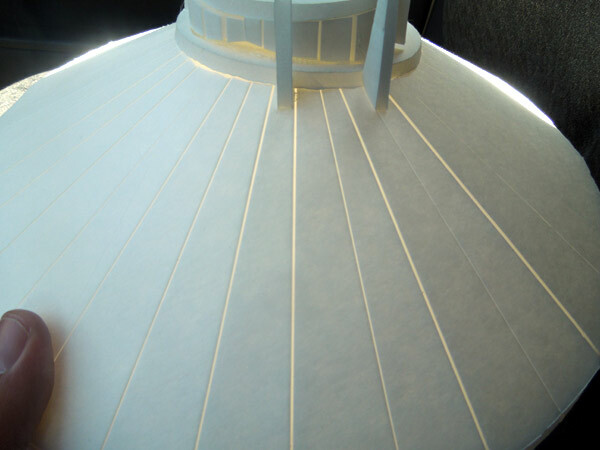 When I finally got the cone right, slicing off the top to add that angled roof section was a bit scary. After that, I added some foam spikey bits and finished with a damn good looking Space Mountain! This was one of the few buildings which wouldn't need to be painted. I wished every building was white, this construction would be a breeze! Next I decided to put together a pyramid for Indiana Jones' Temple of the Forbidden Eye ride. 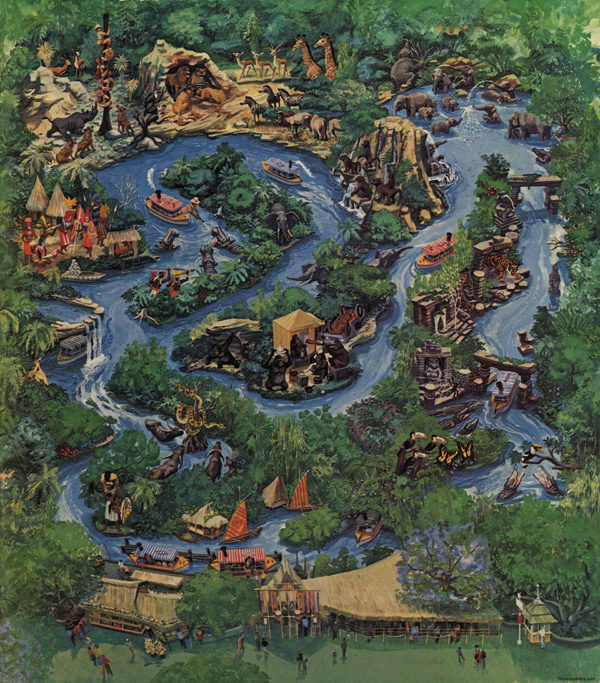 This ride has a hidden entrance within a jungle setting, so the pyramid structure only really exists on the illustrated Disneyland map. 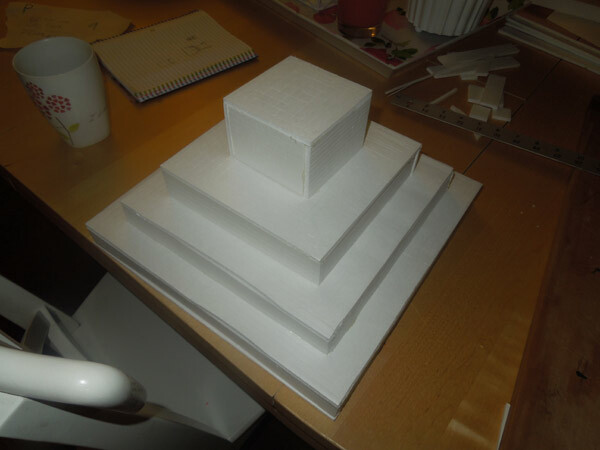 Again, I began with the dimensions of the base and figured out how many steps would result in the most appealing ziggurat. 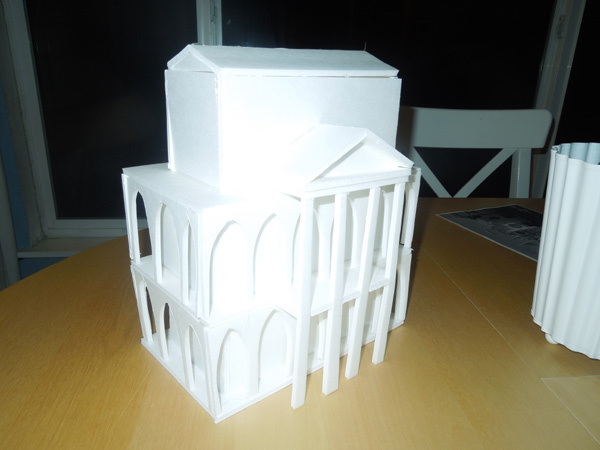 It wasn't until after I was finished that I realized the temple was fairly rounded, particularly at the top. If I had enough time, I'd probably re-design this building. The next building was the haunted mansion. This was fairly straightforward plantation style mansion, but I wasn't happy with my ability to render porch areas defined by ornate ironwork. I opted for arched doorways and hoped that this would make the same impression. Obviously this will have to be painted, but I'd put that off until later. Maybe I could learn how to paint by October. Next I wanted to try Autopia's roadway. 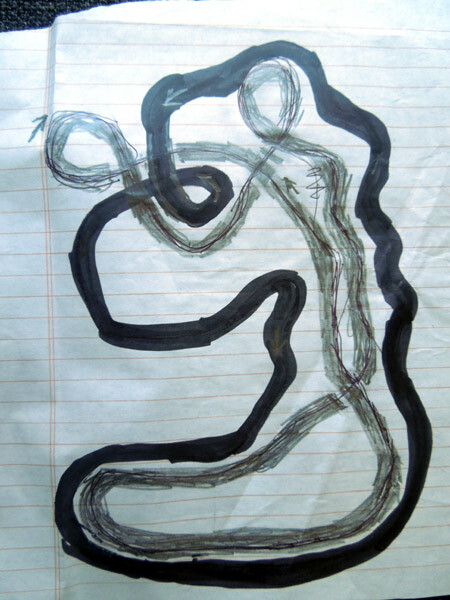 For this attraction, I brought home some black foamboard and studied the path of the dual Autopian roadways. They are surprisingly complex! 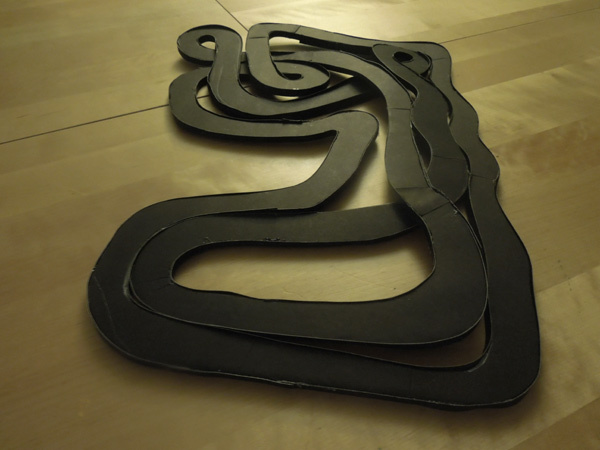 I used a sharpie to rough out the accurate road path into a shape which matched my costume's autopia footprint. 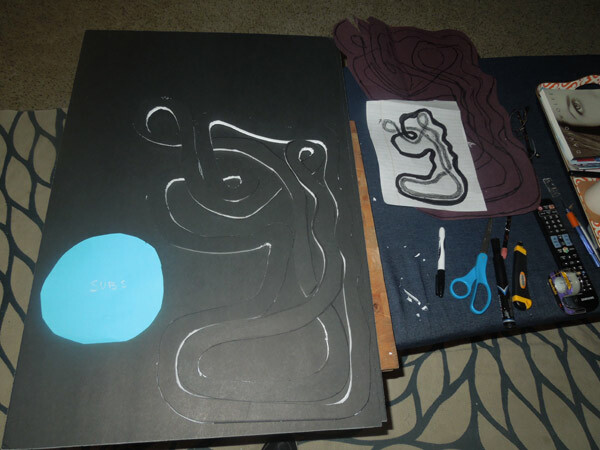 Then I transferred this shape to foamboard and carefully cut the roadway's shape from it. I also trolled through toy store aisles looking for tiny cars. Two separate manufacturers make very small toy cars which would work at my scale - nano speed cars and nitro micro cars. They were only about a dollar each, but they had too much detail for my project. I waited. Maybe I could find something better in the weeks ahead. With all the foam roadway cut out, and black edging in place, the roadway for Autopia looked awesome. Can you believe the real park roadway follows the precise lines of this woman's face as drawn by Picasso? In Disneyland the Autopia roadway butts up against the lake for the submarine ride. That will be tough to render, but if I could pull it off, this costume could be amazing. I decided years ago that a great costume needs a face, and that face can't be at your waist, or far above your head. It needs to be right at the top of your neck. 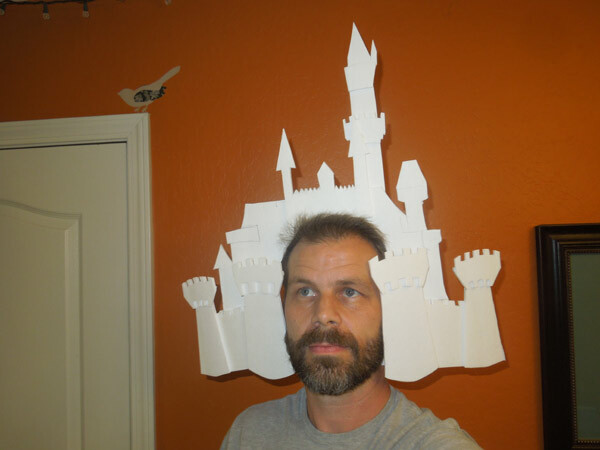 The face for this costume will be tucked inside Sleeping Beauty's castle. One of the contests I like in Sacramento, the at Thunder Valley Casino, specifies that you cannot wear a mask or obscure your face. This design should pass their test. I guess my jaw will be the drawbridge! I won't be able to use foam board for all of the buildings in Disneyland, but it was best for these few.